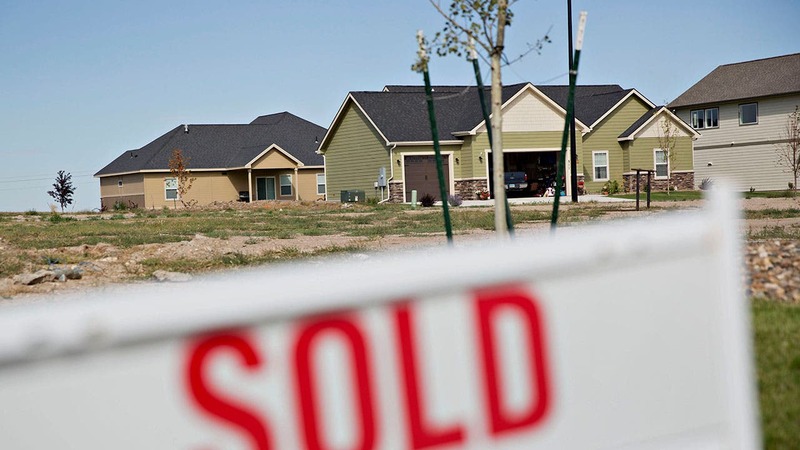 Time is running short for people who want to take advantage of the homebuyer tax credits. 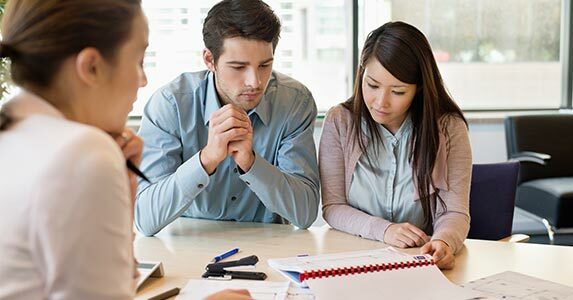 There are two homebuyer federal income tax credits: the first-time homebuyer tax credit of up to $8,000, and the move-up homebuyer tax credit of up to $6,500. Both come with deadlines. To collect either tax credit, buyers have to have homes under contract by April 30. That means that buyer and seller must have signed the purchase contract by that date. After that, there’s another deadline: The transaction has to close by June 30. If you want to collect the tax credit, don’t wait until the last half of April to begin looking for a house. Yes, it’s possible that you could do it all in a couple of weeks: find a house that you like, negotiate a price and secure mortgage financing. Possible, but not probable. “Don’t wait till the last minute, and be prepared to stay on top of things from the very outset,” says Neil Garfinkel, a lawyer with the law firm of Abrams Garfinkel Margolis Bergson LLP, on New York’s Long Island. 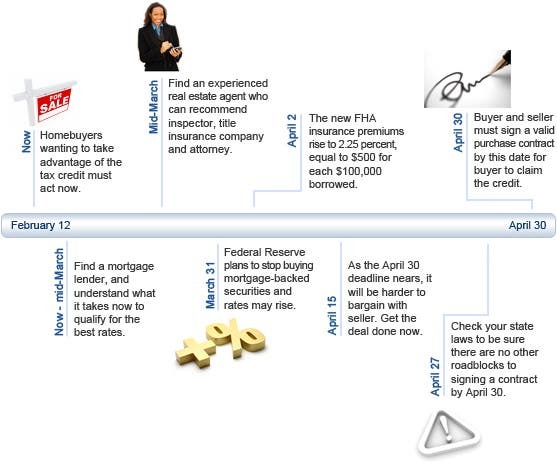 Below is a timeline for homebuyers who want to complete the transaction on time to collect the federal income tax credit. The following dates aren’t ironclad; the real estate agent, lender and title company will know if you need to deviate from this timeline because of your situation or location. Use this timeline as a general guide and as motivation to take action quickly. Above all, let everyone — from the lender to the seller to the inspector — know about your deadlines. Click on the synopsis for full details on what to do on that date. Find a real estate agent who not only will show you homes in your preferred neighborhoods and price range, but also has a referral network of trustworthy service providers: inspectors, title insurance providers and attorneys. And introduce yourself to those service providers before you need them, so they’ll know who you are when you request work from them. By this date, the Federal Reserve plans to stop buying mortgage-backed securities. This matters because many economists and mortgage bankers expect mortgage rates to rise when the Fed withdraws from the market and investors step in. To be assured of getting the lowest mortgage rate, you need to have the rate locked by the end of March. And to have a locked rate, you need to have a house under contract. You can’t lock a rate while you’re still looking for a house. Getting an FHA-insured mortgage? Get your mortgage application approved by the close of business on this date, because prices go up after that. The upfront mortgage insurance premium for Federal Housing Administration-insured loans will rise from 1.75 percent to 2.25 percent. That’s a premium increase of $500 for each $100,000 borrowed. The FHA will institute other, more strict rules, too, such as reducing the seller’s allowable contribution. The new FHA rules go into effect for loans with new case numbers issued on or after Monday, April 5. In practice, this means you need a case number by Friday, April 2. Keep this in mind: The closer you get to the April 30 deadline, the more difficult the negotiation between buyer and seller can get. Why? Because urgency and greed enter the equation. 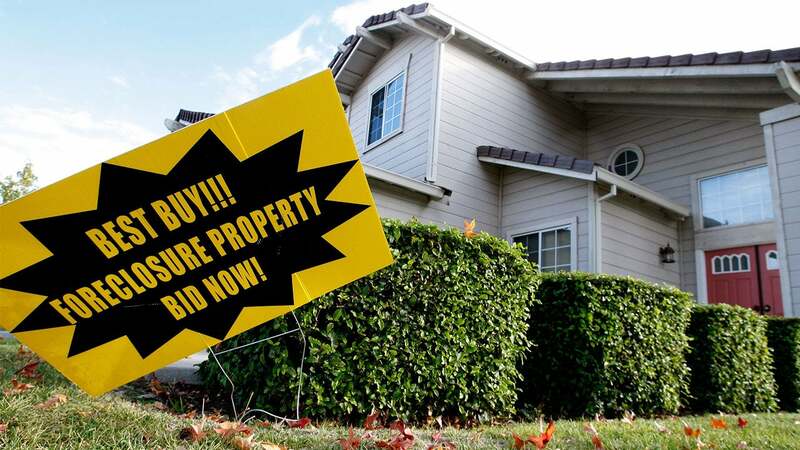 If you wait to make an offer on a house with two weeks or less remaining before the April 30 deadline, the seller can play hardball. 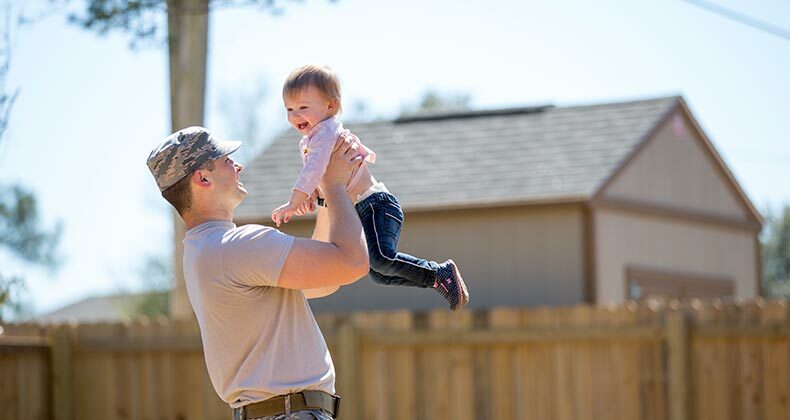 After all, you have just a few days to seal the deal and get the tax credit — and if you have waited this long, you might not have any serious options besides the house you’re making an offer on. A gutsy seller could hold firm on price, in effect forcing you to share the gift from Uncle Sam. As a buyer, you have a strong hand, too. If you don’t reach a deal by April 30, you can walk away and the seller has to find another buyer. That’s not a sure thing in this market. To avoid this game of chicken, try to reach a deal before the second half of April. In New Jersey, make sure the buyer and seller sign the purchase contract by this date. New Jersey has a three-day attorney review period, effectively making April 27 the deadline to have the house under contract by April 30. To be on the safe side, it’s a good idea for residents of the other states to try to have the house under contract by this date, just in case hitches hold things up by a day or two. Make sure the buyer and seller sign a valid purchase contract by this date. Otherwise, the buyer isn’t eligible to collect the tax credit.